The Lesvos Bird Records Committee (LBRC) has accepted the following records for 2013 (see 2013 report here). Pair on the Tsiknias River early morning 25 Apr (P & V Manning, C & L Williams). Pair Parakila Marsh 17 Apr (photo: T Koufaki, E Galinou). 2 birds seen in spring at various sites throughout the west of the island (Lardia Valley westwards) 18 Apr – 7 May (photo: S Wessmer, S P Dudley, R Purser et al) and 14 May (photo: M & T Sviekutis). 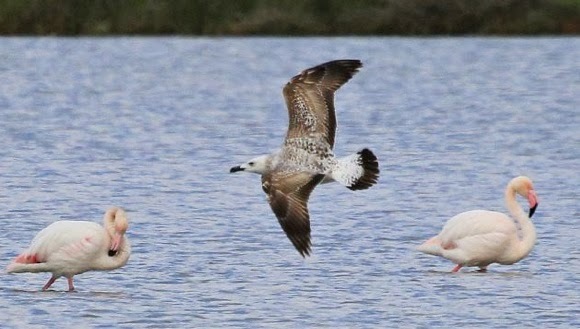 One of these birds was also seen on 9 May (G Melchiorri, G Massetti) but without a photo it is not possible to say which of the two birds it was. These three birds are the 2nd - 4th confirmed records for Lesvos (first record was in Nov 2012). Subadult between Antissa and Ipsilou 5 May (photo: T Binks, S P Dudley) was retrospectively identified and accepted from photos provided. 2CY Alikoudi Pool 17 Mar (photo: P Tsakmakis, S Wytema). 1 Alykes Wetlands 2 May (B Buckler, P & V Manning et al). This record was narrowly accepted reflecting the difficulty in assessing records of this species, especially when the bird in questions is both out of the expected season of occurrence and in an unexpected location.